I saw this car the other day. 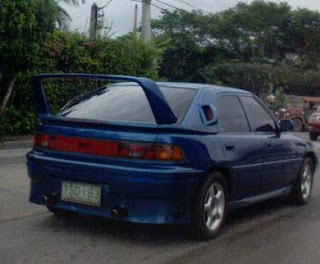 This car's spoilers are as high as the rooftop. Much as I think spoilers add pizazz to a car, I prefer spoilers to be closer to the car rather than declaring a state of independence. I thought of one good use for it though, a clothes hanger. If you happen to forget to remove the clothes and drive, think of it as a faster way of drying them.